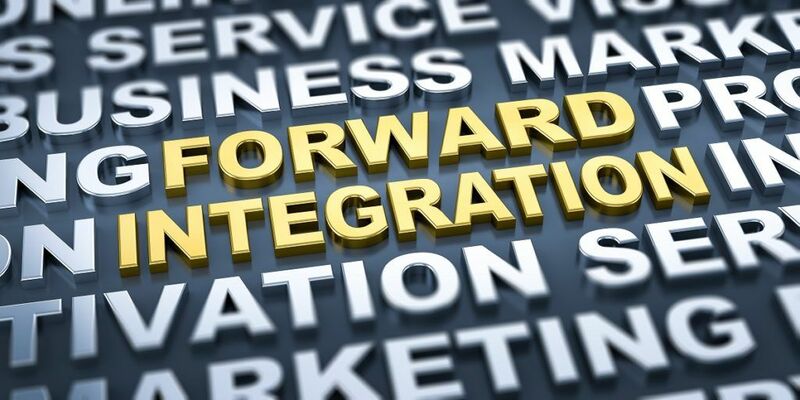 Forward integration is a form of vertical integrationVertical IntegrationA vertical integration is when a firm extends its operations within its value chain. It means that a vertically integrated company will bring in previously in which a company moves forward on its production path towards the distribution of its products or services. Essentially, a company undertakes forward integration by acquiring or merging with business entities that were its customers while still maintaining control over its initial business. The concept of forward integration is inherently related to the concept of supply chainSupply ChainSupply chain is the entire system of producing and delivering a product or service, from the very beginning stage of sourcing the raw materials to the final. In many industries, the major components of supply chain include raw materials, intermediate goods, manufacturing, marketing and sales, and after-sales service. An example of forward integration is a situation when a manufacturer purchases its retailer to secure control over the distribution channels. Forward integration is the opposite of backward integration, which is a strategy of acquiring the companies that were once its suppliers. A company may increase its market share by implementing forward integration strategy. Generally, the strategy eliminates various transaction and transportation costs that subsequently result in a lower final price for the company’s product. Thus, a company can achieve greater market share through lower product prices. A company employs the strategy if it is willing to obtain control over distribution channels in its industry. Control is crucial for companies that operate in industries that lack qualified distributors or in situations when distributors charge significant costs. The control over distribution channels ensures the strategic independence of a company from third parties. Successful implementation of the strategy may provide a company with a competitive advantageCompetitive AdvantageA competitive advantage is an attribute that allows a company to outperform its competitors. Competitive advantages allow a company to achieve over its competitors. Low costs and control over industry distribution channels can become key factors in achieving competitive advantage. The integration of entities forward of the company’s production vertical strengthens its position in the industry and establishes obstacles to potential rivals. For example, if a company integrates a large industry retailer, probable competitors could face limited access to distribution channels. Merger and acquisition deals related to forward integration may create various inefficiencies as a result of the enlarged bureaucratic apparatus of the new business entity. In the forward integration strategy, a company may fail to realize synergiesTypes of SynergiesM&A synergies can occur from cost savings or revenue upside. There are various types of synergies in mergers and acquisition. This guide provides examples. A synergy is any effect that increases the value of a merged firm above the combined value of the two separate firms. Synergies may arise in M&A transactions between the involved entities. Improper implementation of the strategy can be one of the reasons for the unrealized synergy potential. Mergers or acquisitions necessary for undertaking forward integration may require substantial funds to execute. A company must be certain that the benefits from the implementation of the strategy will exceed its costs.